The Native American story of Tamahay. Learn about the culture, stories, myths and legends of American Indians and their famous chiefs and tribes. A Native American Story of Tamahay to teach kids about Native Indians in a short, enjoyable, easy to read format. "The 'Great Mystery' has decreed that I must be disgraced. There will be no pleasure for me now, and I shall be ridiculed even by my enemies. It will be well for me to enter soon into Paradise, for I shall be happy in spending my youth there. But I will sell my life dearly. Hereafter my name shall be spoken in the traditions of our race." With this speech Tamahay began his career. He now sought glory and defied danger with even more than the ordinary Indian recklessness. He accepted a personal friend, which was a custom among the Sioux, where each man chose a companion for life and death. The tie was stronger than one of blood relationship, a friendship sealed by solemn vow and covenant. Tamahay's intimate was fortunately almost his equal in physical powers, and the pair became the terror of neighboring tribes, with whom the Dakotas were continually at war. They made frequent raids upon their enemies and were usually successful, although not without thrilling experiences and almost miraculous escapes. Upon one of these occasions the two friends went north into the country of the Ojibways. After many days' journey, they discovered a small village of the foe. 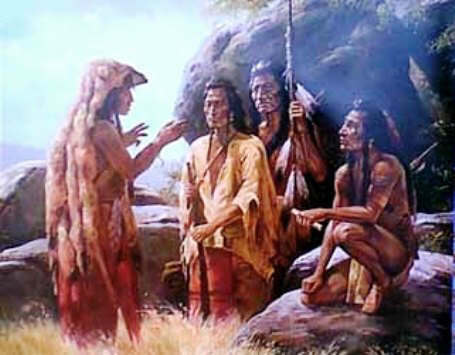 The wicked Tamahay proposed to his associate that they should arrange their toilets after the fashion of the Ojibways, and go among them; "and perhaps," he added, "we will indulge in a little flirtation with their pretty maids, and when we have had enough of the fun we can take the scalp of a brave or two and retreat!" His friend construed his daring proposition to be a test of courage, which it would not become him, as a brave, to decline; therefore he assented with a show of cheerfulness. The handsome strangers were well received by the Ojibway girls, but their perilous amusement was brought to an untimely close. A young maiden prematurely discovered their true characters, and her cry of alarm brought instantly to her side a jealous youth, who had been watching them from his place of concealment. With him Tamahay had a single-handed contest, and before a general alarm was given he had dispatched the foe and fled with his scalp. The unfortunate brave had been a favorite and a leader among the tribe; therefore the maddened Ojibways were soon in hot pursuit. The Sioux braves were fine runners, yet they were finally driven out upon the peninsula of a lake. As they became separated in their retreat, Tamahay shouted, "I'll meet you at the mouth of the St. Croix River, or in the spirit land!" Both managed to swim the lake, and so made good their escape. The exploits of this man were not all of a warlike nature. He was a great traveler and an expert scout, and he had some wonderful experiences with wild animals. He was once sent, with his intimate friend, on a scout for game. They were on ponies. They located a herd of buffaloes, and on their return to the camp espied a lonely buffalo. Tamahay suggested that they should chase it in order to take some fresh meat, as the law of the tribe allowed in the case of a single animal. His pony stumbled and threw him, after they had wounded the bison, and the latter attacked the dismounted man viciously. But he, as usual, was on the alert. He "took the bull by the horns", as the saying is, and cleverly straddled him on the neck. The buffalo had no means of harming his enemy, but pawed the earth and struggled until his strength was exhausted, when the Indian used his knife on the animal's throat. On account of this feat he received the name "Held-the-Bull-by-the-Horns." The origin of his name "Tamahay" is related as follows. When he was a young man he accompanied the chief Wabashaw to Mackinaw, Michigan, together with some other warriors. He was out with his friend one day, viewing the wonderful sights in the "white man's country", when they came upon a sow with her numerous pink little progeny. He was greatly amused and picked up one of the young pigs, but as soon as it squealed the mother ran furiously after them. He kept the pig and fled with it, still laughing; but his friend was soon compelled to run up the conveniently inclined trunk of a fallen tree, while our hero reached the shore of a lake near by, and plunged into the water. He swam and dived as long as he could, but the beast continued to threaten him with her sharp teeth, till, almost exhausted, he swam again to shore, where his friend came up and dispatched the vicious animal with a club. On account of this watery adventure he was at once called Tamahay, meaning Pike. He earned many other names, but preferred this one, because it was the name borne by a great friend of his, Lieutenant Pike, the first officer of the United States Army who came to Minnesota for the purpose of exploring the sources of the Mississippi River and of making peace with the natives. Tamahay assisted this officer in obtaining land from the Sioux upon which to build Fort Snelling. He appears in history under the name of "Tahamie" or the "One-Eyed Sioux." Always ready to brave danger and unpopularity, Tamahay was the only Sioux who sided with the United States in her struggle with Great Britain in 1819. For having espoused the cause of the Americans, he was ill-treated by the British officers and free traders, who for a long time controlled the northwest, even after peace had been effected between the two nations. At one time he was confined in a fort called McKay, where now stands the town of Prairie du Chien, Wisconsin. He had just returned from St. Louis, and was suspected of exciting his people to rebel against British subjects. His life was even threatened, but to this Tamahay merely replied that he was ready to die. A few months later, this fort was restored to the United States, and upon leaving it the British set the buildings on fire, though the United States flag floated above them. Some Indians who were present shouted to Tamahay, "Your friends', the Americans', fort is on fire!" He responded with a war whoop, rushed into the blazing fort, and brought out the flag. For this brave act he was rewarded with a present of a flag and medal. He was never tired of displaying this medal and his recommendation papers, and even preserved to the end of his life an old colonial stovepipe hat, which he wore upon state occasions. 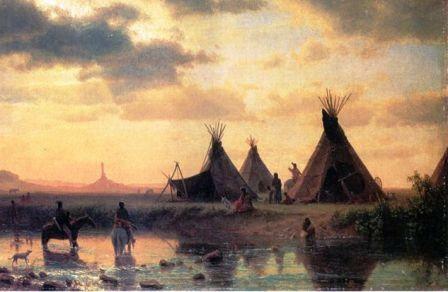 The Sioux long referred to the president of the United States as "Tamahay's father." The following story is told of him in his later days. He attempted one day to cross the first bridge over the Mississippi River, but was not recognized by the sentinel, who would not allow him to pass until he paid the toll. Tamahay, who was a privileged character, explained as best he could, with gestures and broken English, that he was always permitted to pass free; but as the sentinel still refused, and even threatened him with his bayonet, the old Indian silently seized the musket, threw it down into the waters of the Mississippi and went home. Later in the day a company of soldiers appeared in the Indian village, and escorted our hero to a sort of court-martial at the fort. When he was questioned by the Colonel, he simply replied: "If you were threatened by any one with a weapon, you would, in self-defense, either disable the man or get rid of the weapon. I did the latter, thinking that you would need the man more than the gun." Finally the officer said to them, "I see you are both partly wrong. Some one must be responsible for the loss of the gun; therefore, you two will wrestle, and the man who is downed must dive for the weapon to the bottom of the river." Scarcely was this speech ended when Tamahay was upon the soldier, who was surprised both by the order and by the unexpected readiness of the wily old Indian, so that he was not prepared, and the Sioux had the vantage hold. In a moment the bluecoat was down, amid shouts and peals of laughter from his comrades. Having thrown his man, the other turned and went home without a word. Sad to say, he acquired a great appetite for "minne-wakan", or "mysterious water", as the Sioux call it, which proved a source of trouble to him in his old age. It is told of him that he was treated one winter's day to a drink of whisky in a trader's store. He afterwards went home; but even the severe blizzard which soon arose did not prevent him from returning in the night to the friendly trader. He awoke that worthy from sleep about twelve o'clock by singing his death dirge upon the roof of the log cabin. In another moment he had jumped down the mud chimney, and into the blazing embers of a fire. The trader had to pour out to him some whisky in a tin pail, after which he begged the old man to "be good and go home." On the eve of the so-called "Minnesota Massacre" by the Sioux in 1862, Tamahay, although he was then very old and had almost lost the use of his remaining eye, made a famous speech at the meeting of the conspirators. These are some of his words, as reported to me by persons who were present. "What! What! is this Little Crow? Is that Little Six? You, too, White Dog, are you here? I cannot see well now, but I can see with my mind's eye the stream of blood you are about to pour upon the bosom of this mother of ours" (meaning the earth). "I stand before you on three legs, but the third leg has brought me wisdom" [referring to the staff with which he supported himself]. "I have traveled much, I have visited among the people whom you think to defy. This means the total surrender of our beautiful land, the land of a thousand lakes and streams. Methinks you are about to commit an act like that of the porcupine, who climbs a tree, balances himself upon a springy bough, and then gnaws off the very bough upon which he is sitting; hence, when it gives way, he falls upon the sharp rocks below. Behold the great Pontiac, whose grave I saw near St. Louis; he was murdered while an exile from his country! Think of the brave Black Hawk! Methinks his spirit is still wailing through Wisconsin and Illinois for his lost people! I do not say you have no cause to complain, but to resist is self-destruction. I am done." It is supposed that this speech was his last, and it was made, though vainly, in defense of the Americans whom he had loved. He died at Fort Pierre, South Dakota, in 1864. His people say that he died a natural death, of old age. And yet his exploits are not forgotten. Thus lived and departed a most active and fearless Sioux, Tamahay, who desired to die young! This story of Tamahay is featured in the book entitled Indian Heroes and Great Chieftains by Charles A. Eastman which was published by Little, Brown and Company, Boston in 1918. The Native American Indian Story of Tamahay provides an opportunity to read about the life and times of Native American Indians and many of their great chiefs and famous leaders. A Classic Short story about Tamahay for kids and children of all ages. This short story of Tamahay is great to read to kids and children at bedtime. This very short story contains folklore about the famous people of Native Indian tribes. This short Native American story has been selected to keep the attention of kids and children of all ages. Many of the traditional stories featured in this section are true and others are folk stories or myths and legends. Read our free short story online about Tamahay. Read a free, online short story about the people of famous tribes Native American Indians to increase knowledge and understanding of the indigenous people of North America. The Story of Tamahay. Discover the vast selection of pictures which relate to the Stories, History and Culture of Native Americans. The pictures show the clothing, War Paint, weapons and decorations of various Native Indian tribes that can be used as a really useful educational history resource for kids and children of all ages. We have included pictures and videos to accompany the main topic of this section - The Native American story of Tamahay. The videos on this website enable fast access to the images, paintings and pictures together with information and many historical facts. All of the articles and pages can be accessed via the Native Indian Tribes Index - a great educational resource for kids.